24 cm x, 198 p. : ill. Reprint. Originally published: Cullompton: Willan, 2002. This book reports the result of research carried out in a busy London police station on the role and impact of closed-circuit television (CCTV) in the management and surveillance of suspects - the most thorough example of the use of CCTV by the police in the world. 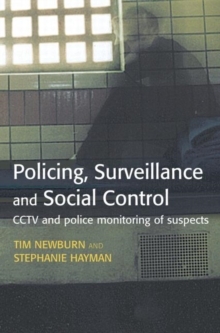 It focuses on the use of CCTV in a very different environment to that in which its impact has previously been studied, and draws upon the analysis of CCTV footage, suspects' backgrounds and extensive interviewing of both police officers and suspects. The research is situated in the context of concerns about the human rights implications of the use of CCTV, and challenges criminological and social theory in its conceptualisation of the role of their police, their governance and the use of CCTV. It raises key questions about both the future of policing and the treatment of suspects in custody. A key theme of this book is the need to move away from a narrow focus on the negative, intrusive face of surveillance: as this study demonstrates, CCTV has another 'face' - one that potentially watches and protects. Both 'faces' need to be examined and analysed simultaneously in order to understand the impact and implications of electronic surveillance.